A couple months ago, the fam and I were strolling down Main St. in OTR for one of their Second Sundays events and I came across a vendor with some popcorn samples. We had Lola with us, so I thought it would be a perfect little snack for her, but I stole a bite before giving her the little sample cup. HOLY COW. What was that amazingness I just experienced?!? I got to talking with the guy (Kevin) at the table and he said he’s always had a passion for unique flavors and spices. And he got the idea to put them on popcorn when hanging out at a friends (who happened to have pretty bare cupboards, but they were pretty hungry). Long story short, he decided to leave his high-powered (and high stress) job in NYC where he was living to chase down his dream of being an entrepreneur…. 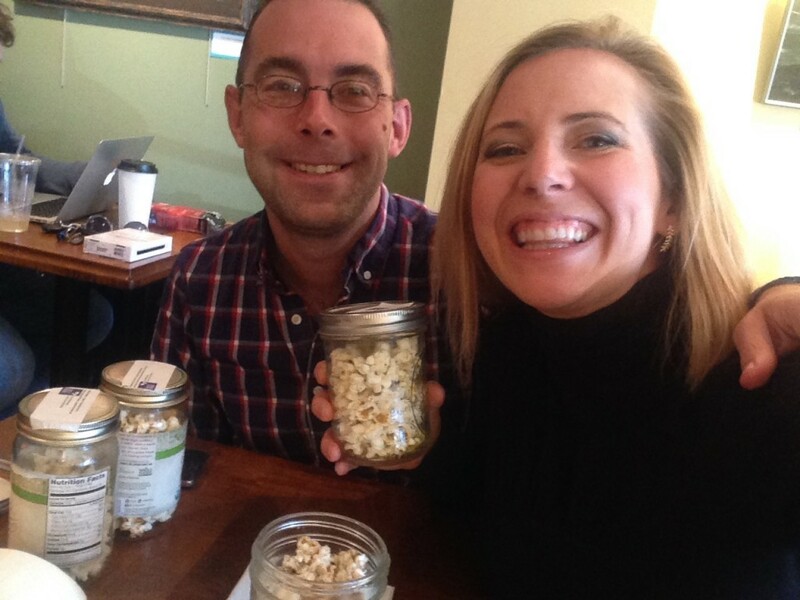 and popcorn flavoring aficionado … as the owner of People’s Republic of Popcorn. I invited him to have sampling at our upcoming event this Friday at Blaine’s if you’d like to try some out for yourself! Hope to see you there! Enjoy: If you like shopping in Montgomery, you’ll LOVE this event! Enjoy complimentary wine and refreshments, swag bag, 5-minute massages, and find something for everyone on your list as you browse a variety of Montgomery-based businesses with pop-up shops, all under one roof! Bring a Toys for Tots (new toy) donation, and receive 10% off your purchase at Blaine’s! We have an event coming up on Saturday that would make for the PERFECT start to date night! Come join us for a drink, viewing SUPER cool cars, and lots of awesome shopping. And it benefits a great cause (Arthritis Foundation) that’s near and dear to my heart. Details below! Me and the hubby will be there! So excited! Hope to see you then! Enjoy: swag bag, wine and bourbon tastings, light bites and a premium cigar selection. Also, view classic cars and shop for a cause, as 10% of all sales will be donated to the Arthritis Foundation! As you probably know by now, arthritis is something that hit our family hard over the past few years (click here for more about that). Ever since my husband Pete was diagnosed with rheumatoid arthritis a decade ago, he’s been using the Arthritis Foundation resources to connect with others, access information and find new physicians. We’ve gotten more and more involved over the years, to the point where Pete and his dad are on chapter boards, and his mom, sister and I are on event planning boards. This year, I decided that it’s time to do a Cincy Chic and Cincinnati Profile (the male version of Cincy Chic that I help run) event to raise funds for the Arthritis Foundation. So, I got together with one of Pete’s favorite menswear shop – Blaine’s in Montgomery – and put together this event concept (see all the details below) of “Cars, Cigars & Style”. I hope to see you there! Win $500 Date Night Package This Thursday! If you need help shopping for your honey, make sure you clear your cal for this Thursday. We’re having a fun event at Blaines in Montgomery from 6-9pm where you can shop, get pampered with free salon and spa services, watch a fab menswear fashion show (hello, eye candy! ), eat, drink and be merry! Oh, and the best part, you can win BIG! We have a $50 gift certificate to La Silhouette Lingerie up for grabs and – get this – a Date Night Package valued at $500! It includes dinner at LaPoste and a gift certificate for a jewelry makeover at Paolo Jewelers ($500 value!). Click here to learn more and RSVP for the event and I hope to see you there! We all know I’m slightly addicted to shoes. I do my weekly Fabushoe Friday… my parents met in the Sears shoe department… and my husband has even more shoes that me (we’re a perfect PAIR… get it?! haha!). I went to the Blaine’s Menswear event, put on by Cincinnati Profile (i.e., men’s version of Cincy Chic/localized GQ mag), a couple weeks ago and I was pleasantly surprised at all the fun and colorful Allen Edmonds shoes they had there for their fashMANista shoppers! As my friend Bob Schwartz puts it “….now a days men’s shoe stores are beginning to look like Allen Edmonds dropped acid.” haha! SO true! Check out Bob’s blog covering the event. “Throw in red or white soles, and its getting very interesting…” he says. I couldn’t have said it better myself. So, extend your love for fashion down to your feet with some fun shoes… highly recommend checking out the shoes at Blaine’s. 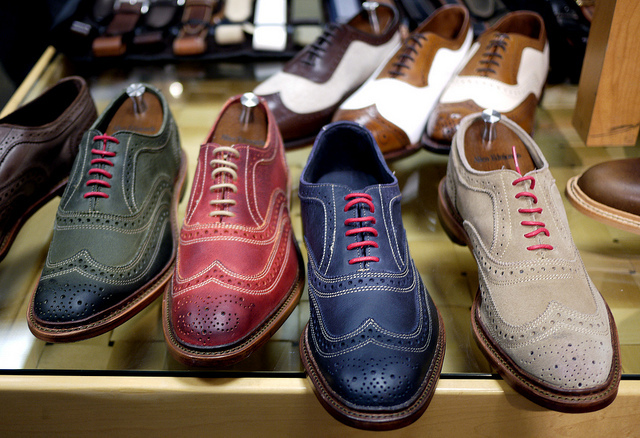 Last week, I told you about the Blaine’s Robert Graham/Allen Edmonds trunk show on April 12. The event will feature a fashion show showcasing the latest Spring and Summer trends from Robert Graham and Allen Edmonds, live DJ music, interact with local style bloggers, and enjoy cigars from DEPs Fine Wine & Spirits as well as complimentary wine and cocktails featuring Bourbon Vodka. Men and women are welcome to attend! Also, my blogger friends from Folk & Feather, Ostentology, Josh Stevens, and Style Everyday will be there! 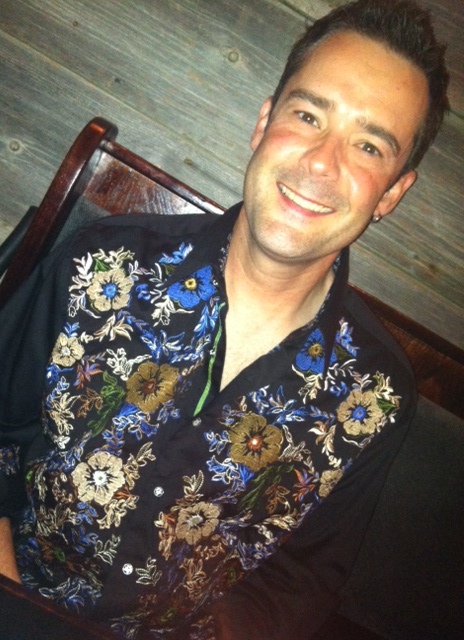 My hubby, Pete, actually wore a Robert Graham shirt over the weekend so I had to snap a pic to give you an idea of how awesome these shirts are. They always have great colors, prints, and little details – like the floral, paisley, polka dot, silk and metallic inside the collar, cuffs and interior trim! I can’t wait to see what’s new at the trunk show! See you there! I’m super excited about this event coming up! Join Cincy Chic, Cincinnati Profile and Blaine’s Fine Men’s Apparel for an evening filled with fashion and fun. 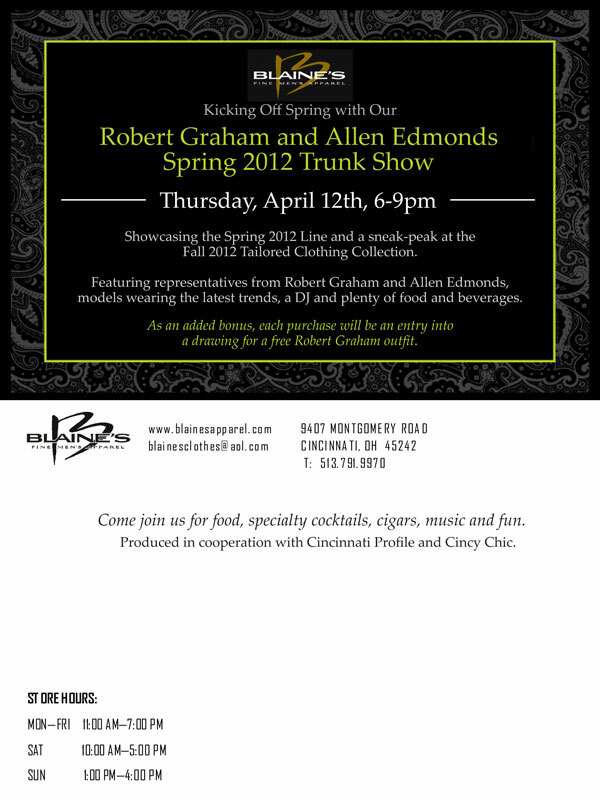 Enjoy a fashion show showcasing the latest Spring and Summer trends from Robert Graham and Allen Edmonds, live DJ music, interact with local style bloggers, and enjoy cigars from DEPs Fine Wine & Spirits as well as complimentary wine and cocktails featuring Bourbon Vodka. Men and women welcome to attend! My blogger friends from Folk & Feather, Ostentology, Josh Stevens, and Style Everyday will be there! Hope to see you there! 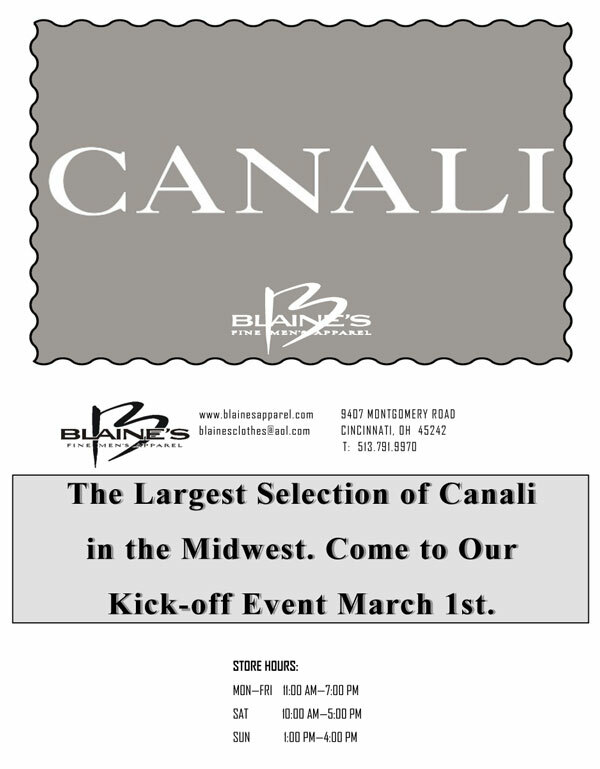 They are having an event on March 1 to celebrate and kick-off their biggest-and-best-in-the-Midwest Canali collection! The last event I went to at Blaine’s was super fun, so I’m looking forward to this one too!